Our guide to Madrid seafood restaurants is always going to arbitary, especially whilst everyone has their personal tastes and preferences, what we instead try to do is bring you those restaurants that are popular with the natives. 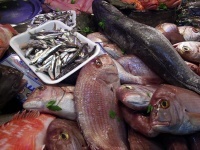 There are some typical Spanish seafood dishes that have to be tried and half of this page is dedicated to those. The other half of the page relates to the best Madrid seafood restaurants to try them in! With a northern coastline bordering the Bay of Biscay and the Atlantic ocean as well as a southern coastline along the mediteranean Spain enjoys the benefit of two distinct flavours and very different styles of cooking. Dishes from the northern part of Spain tend to be fish based whilst those from the south are more related to shellfish and crustaceans. With Madrid being in the middle of the two you can experience the best of both worlds. Probably one of Spains most famous dishes this rice based dish comes from the Valencia region where Arabs during the moorish occupation of Southern Spain cultivated rice. Officially the Paella should be based around chicken and pork however in time this has been replaced with a variety of seafood which is cooked in a flat wide pan. Nowadays in Madrid seafood restaurants you can find a thousand and one variations of this popular recipe with all manner of ingredients being added depending on the chef. NOTE In most restaurants you will have to order a paella the day before due to its lengthy preperation. Very similar to the paella Arroz Abanda, Pan fried rice, makes use of black rice and shellfish to give it a very distinct taste. Considered in some quarters to have originated as the "poor mans Paella" it now has a dedicated following of its own. Garlic shrimps cooked on a hot grill are popular throughout Madrids bars and restaurants with the quality being somewhat better in the restaurants. 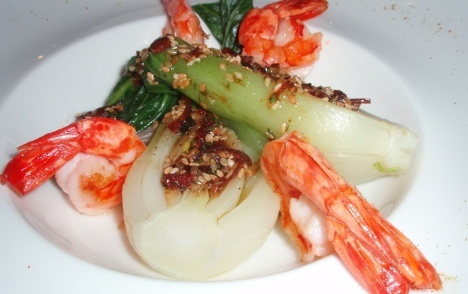 The larger "Langostino" can also be found in most restaurants although their taste is a little stronger. Depending on whether these shellfish come from the Mediteranean, Atlantic, Indian or South Pacific oceans the flavour can vary somewhat. Telephone: 91 522 08 95. Opening Times: 11am to Midnight. Closed Monday evenings. Specialities: Shellfish, fish y home cooking from the Galicia region of Spain. One of our personal favourites due to its central location ( Metro: Callao or Gran via) and informal atmosphere. Run by two brothers from Galicia who came to Madrid almost 20 years ago they pride themselves on the freshness of their seafood and don´t expect you to break the bank just to enjoy a meal in their establishment. Telephone: 91 249 86 05. Specialities: Mixed seafood platter, sirloin steak. For those arriving to Madrid by train Rias Altas offers a cheap and cheerful menu to cater for almost all tastes. Downstairs the restaurant operates as a bar / salon and upstairs is given over to formal dining. The menu here is cheap and plentiful and for less than 15€ you can eat well. Telephone: 91 577 82 87. Specialities: Galician cooking, Octopus and Squid. With the cheapest meal costing around 60€ this is one of Madrids luxury seafood restaurant. Free valet parking and the need to reserve in advance are befitting of the upmarket location in Barrio Salamanca. Telephone: 91 554 77 84. Another of Madrid´s luxury seafood restaurants Combarro was opened in 1977 and has been a regular on the agenda of the rich and famous ever since. Meals average around 70€ a head although can cost a lot more depending on the wine selected. Valet parking is standard.